I Love my Vitamix!!! It is a blender and so much more. We are what we eat and think. To find Real Happiness and maintain it, we need to maintain a Healthy state of Mind. Meditating and what you eat determines how well you cope with the stresses of the world. Because we are all so busy these days, it is particularly important to get the most vitamins, minerals and nutrition from what we do eat! It is important to eat foods that are high in nutrition. To keep the most nutrients in your food, the closer to raw the better. Keep in mind that overcooked and processed foods give us little nutrition. That is why you are often hungry just shortly after eating! That's another reason I Love my Vitamix. Where else can you blend your vegies and turn them into a hot soup; all within minutes, in one container, and keep most of the nutritional integrity? Change the container and grind your own fresh flour from rice, grains, nuts, etc. (especially important for gluten free eaters. The taste and nutrition of your baked goods are at a maximum! Actually, everything you make in your Vitamix has intensified flavor and nutriton. I have yet to find a faster more efficient way to get the most professional results and the most benefits from the food I buy! When you get the extra nutrition, you will find yourself satisfied for longer periods of time and your attitude will be stronger for dealing with life's obstacles! Make healthier dips, smoother creamier sauces! Eat better and consequently feel better.... Use the same quality equipment that chef's and celebrities use! I like to use the multi-use blender for smoothies and vegie drinks rather than using a juicer; because you get the most out of the food (minimal waste) and the pulp and fiber are so important for healthy digestion. Make your own tahini from fresh sesame seeds, or make your own fresh peanut butter! I also grind poppy seeds for poppy seed pastry filling. You can also make ice cream and sorbet with fresh fruit! For parties there is no better ice crusher and drink maker!!! If you are not totally satisfied, there is a 30 day money back guarantee. The company also has a 7 yr warranty on everything! If the prices are a little high, check out the refurbished units for great pricing. 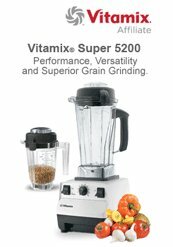 Click here to get FREE SHIPPING and find out more about how Wonderful your Vitamix is!! !